I’ve literally been looking forward to this one since even before the Challenge started, as Dan let me know earlier that he would probably pick this one. It did not disappoint! I think it probably came up in conversation after I saw and LOVED Why Be Good? (1929) at last year’s TCM Fest. This film does bear some similarities to that one. In fact, the story of My Best Girl is fairly routine and even cliched – Joe, the son of the wealthy owner of a 5-and-10 cent store gets a low-level job at the store under an assumed name in order to prove himself; while there he falls in love with shopgirl Maggie, but oops, he’s supposed to be marrying a high society girl. 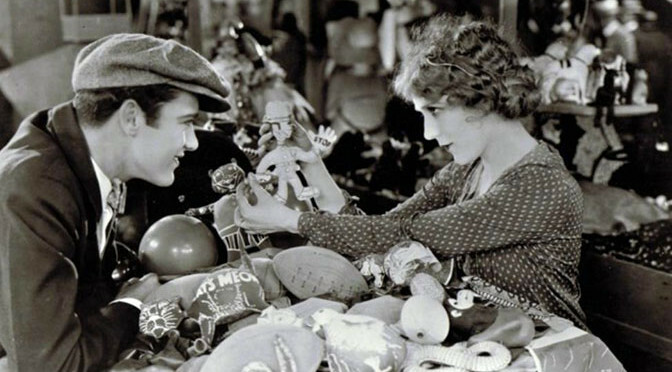 All this goes pretty much as expected, but here’s the thing – Mary Pickford and Charles “Buddy” Rogers are freaking adorable, and all the little in betweens and moments and stage business are wonderful. Truly a case of the execution far exceeding the premise. 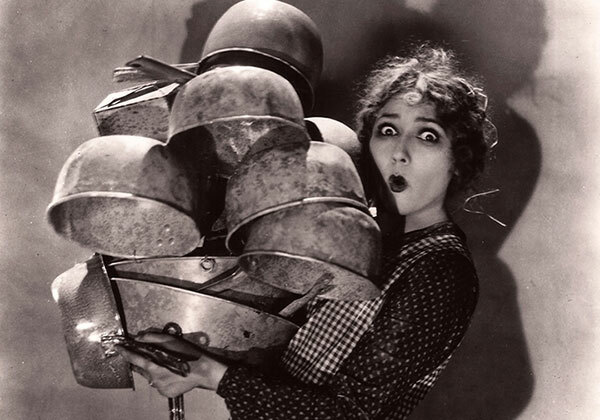 We’re introduced to Maggie as “the stock girl” bringing up a fresh supply of pots and pans for a busy sale. We see only her feet for what seems like minutes. She drops pots, tries to pick them up, drops more, gives up, tries to drag one along with her foot, then gets her foot stuck, and finally shuffles along the floor until her shimmy slips down around her feet. Pan up to her face for the first time. Horrified, she steps out of her slip and over to the side to get rid the pots so she can pick up her underthings – by this time, another woman has unconsciously stepped into the slip on the floor; glancing down, she thinks HER underclothes have slipped off, and she tries to pull them up surreptitiously and sidle over out of sight. Five minutes into the movie, and I’m already totally charmed by this little bit of gentle slapstick. Later, Maggie’s eating her lunch on the back of a truck when it pulls off, and her lunchbox gets knocked off. Joe sees and rushes to bring it back to her. Coyly, she knocks something else off. He’s onto her by the third one, but he doesn’t care – the grin he flashes her before grabbing it and running up to the truck is pure silent screen magic. I love Charles “Buddy” Rogers in Wings as well, but after this, he may be on his way to my pantheon of silent star crushes. I must confess that this is only the second Mary Pickford film I’ve seen; the other, Coquette, was a 1929 attempt to cash in on the flapper rage and remake Pickford in the mold of Clara Bow and Colleen Moore. It didn’t work for me at all (though I should rewatch it; it was one of the first silents I ever saw, and maybe I just wasn’t ready yet). 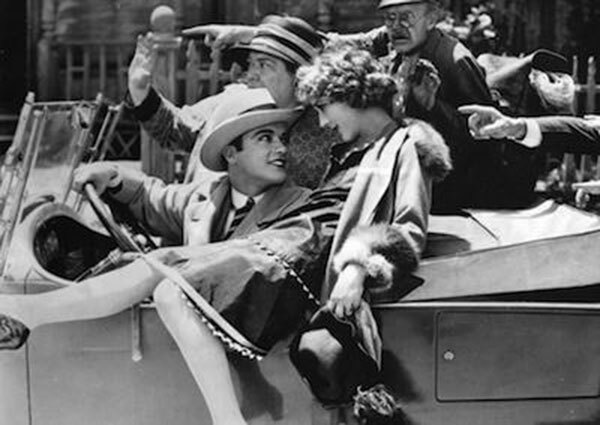 Here, Maggie attempts to play a jazz baby (imitating her sister Liz) toward the end, and fails miserably – Pickford playing someone who fails at being a flapper is way more convincing. What she was is America’s Sweetheart, and you can definitely tell why from this film. She is adorable and sweet and genuine, and when Maggie finds out about Joe’s fiance, her heartbreak and determination not to visibly break down are palpable. The end breaks down just a tad, and here’s where the comparison with Why Be Good? becomes really interesting. In Why Be Good?, Colleen Moore plays a good girl (like Maggie) who’s really good at pretending to be bad, at playing the flapper role (unlike Maggie). A lot of the story is very similar, shopgirl, store owner’s son and the whole bit. But at the end when Why Be Good‘s male lead starts patronizing her (and to be fair, being much more of a jerk than Joe ever is in My Best Girl), Moore tells him off but good, and she 100% means it. In My Best Girl, Maggie’s attempts to break free from Joe’s patronizing “I know what you want” attitude are totally false and he never believes her. Instead, it’s more like “let the girl have her little hysterical moment and then I’ll step in and she’ll see I’m right,” and that’s how it plays out. 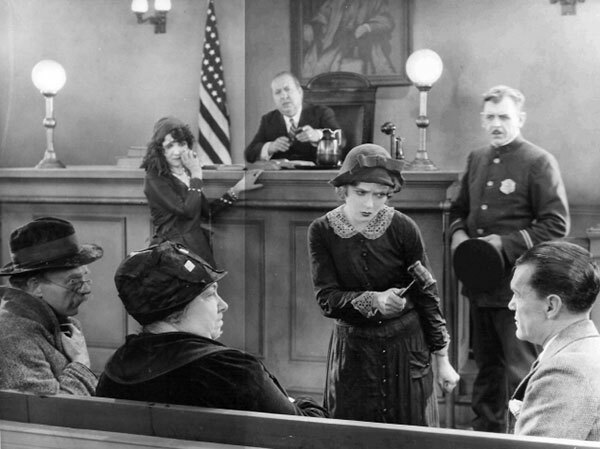 So that was a LITTLE disappointing in comparison with Why Be Good?, but I can’t totally fault a 1920s film for having patriarchal attitudes, and the rest of the film is so completely charming and delightful that I can forgive that one small issue. It is now my #2 Sam Taylor film, my #1 Mary Pickford film, my #2 Charles “Buddy” Rogers film, my #19 Silent Film, and my #5 film of 1927. My Best Girl was recommended by Dan Kocher, a friend from the Flickcharters group on Facebook. Averaging together this #335 ranking with my #263 ranking of his other film, Europa ’51, gives Dan an average ranking of 299. Maggie: [to Joe] You know, you’re awfully dumb. Ma Johnson: I’ve been to the loveliest funeral, pa. I can’t remember the name, but it’s the nicest funeral I’ve been to this week. Liz: My life is my own and I’ll live it my own way! Maggie: You wouldn’t have kissed me if I weren’t your best girl. Joe: Maggie, you ARE my best girl. Maggie: [defending her sister Liz in Night Court] She’s honest! We’re such a happy family, don’t break my mother’s heart! (<-- apparently a great defense) Liz’s douche boyfriend: Rich men’s sons don’t chase after shop girls for the exercise. Maggie: [while failing to do the Charleston] That’s me all over – a red hot mama! Maggie: I’m not a bad girl, Joe, I didn’t mean a word I said. I love you, Joe, but I can never marry you. My family needs me more than you do. Pa Johnson: Like hell we do! From now on I’ll be the father of this family. *sneezes* *trips on bucket* If this feller goes to Honolulu, you’re going with him! ^ This is Carole Lombard. She’s in it for this one scene, uncredited.